There will always be something timeless about a 2D wall painted with a beautiful color, but let us change the way we look at things for a minute. What about having walls that are three dimensional? Introducing 3D walls to a room is like having sculptures on the wall! Unlike a two-dimensional wall, a 3D wall creates a sense of modern elegance and exuberance. The many categories of three-dimensional walls consist of ceramic wall tiles, stone, wood inspired creations, limestone and more. All of these fantastic materials can be used to decorate a residential or commercial environment adding more style and vitality throughout every room! The reliefs on the walls create an enticing play of light and shadows. This creates the look of a three-dimensional object. Depending on the category of the material shape, the light and shadowing may differ. For example, a triangle geometric relief from a ceramic tile can create a “sundial” effect depending on how the light may hit the tiles throughout the day. If a home or business is well lit by sunlight, then you just might have an abundance of mini sundials for your own amusement. Reliefs on the walls can be formed into many sizes and shapes, creating a unique face lift for every wall. There are a plethora of exceptional geometric shapes to integrate into a home or business. Adding texture to a wall makes a huge difference and can liven up a room instantly. Try incorporating some waves or triangles to give the place a little zest. To get really intricate, creating a wall design such as a flower or a tree can bring the room to life for others to see. Most people do not realize that adding faux brick to a room is in fact creating a three-dimensional wall. Just by doing something as simple as this, the space has not only come together, it also gives the space that much more character! Three dimensional walls have the potential to make rooms more exciting or more calming. The can potentially even create a cozy feeling or increase the appearance of how big the room actually is. Depending on what the agenda is for the home or business, three dimensional walls add a sense of personal style and design, not to mention they will absolutely make all of your friends jealous! Our suggestion is to get creative. Go out, be bold and take a chance because as long as it is done correctly and with care, you will be pleasantly surprised! Also, be on the lookout for new places adding in this new wall feature and do not forget to appreciate exactly how much it helps the space come together. The era of two-dimensional wall design will never end, but the era of three dimensional walls is just getting started. Dark Wood, Bright Lights & Cork, Oh My! Bright white and light-colored interior design will always work well to achieve a modern feel, but the darker themes with a few upgraded touches only continue to be a classic look. There is something about dark wood that gives off a comforting, feel-good, welcome home kind of vibe. Good thing there are so many places inside a hotel to incorporate this theme! Think about lining the inside of minibar cabinets with a dark wooden paneling or making the doors inside the guestrooms and suites a dark wood to create that luxury farmhouse feel. Fortunately, some naturally dark woods are considered hardwood which means that while they might be a bit heavier, they are incredibly stable and sturdy. Imagine walking into a room full of new-age, beautiful mahogany furniture. We can vouch that it immediately makes us want to smile! The darker wood is making a comeback, especially when it comes to hotels. The look creates a more organic and high-end picture that customers enjoy when they enter the door. When a space has a lot of dark decor, what is the best solution? Bright light! 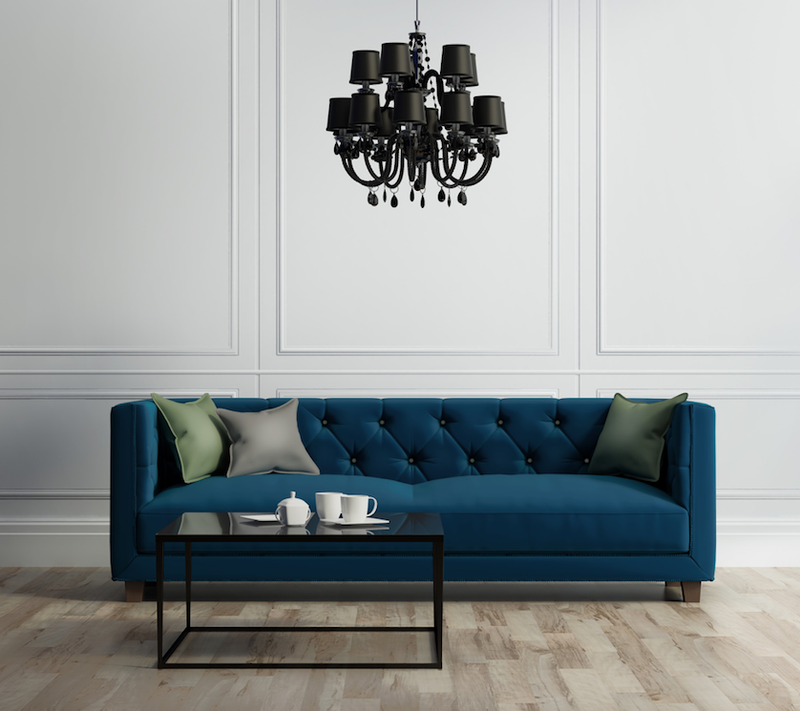 Although the Thomas Edison bulbs are largely in style at the moment, if the furniture and design has a dark tone, those lights will make the place appear more rustic and industrial and create an even darker tone. Unless you’re going for that look, we suggest brightening it up with items such as pendant lights in the kitchen over an island and/or a few chandeliers here and there through the walkway and dining room. It is better to have too many lights than not enough! Try installing dimmer lights throughout in order to change the mood lighting if it does get too bright. Photo courtesy of Petite Friture. Cork, my friends, is IN! No, we are not talking about leftover wine corks that turn into DIY projects. More and more pieces of furniture and wall art are being made with cork. There are chairs, stools, benches, table tops, cabinets, lamp shades, etc. that are popping up all over the world. Of course, we cannot forget about the kitchen appliances as well. Some of these are made up of half ceramic and the upper (or lower) half is...you guessed it...CORK! Who would have thought that this part of a tree would not only be used to keep wine fresh, but to furnish stylish spaces? Not only is it amazingly fashionable at the moment, but according to a 2008 study by Pricewaterhousecoopers, it is more environmentally friendly than the production of aluminum and plastic closures! Not to mention the little honeycomb looking pockets that you see, those pockets make cork buoyant and FIRE RESISTANT! Wow...now that is multipurpose at its best. Now individually, these pieces are wonderful, but put them all into a theme for a house, hotel or even just one guestroom and you won’t ever want to leave! Adding in new pieces and upgrades to a dark wood themed hotel will not take away from the classic beauty it entails. It only enhances that warm and cozy vibe and makes everyone feel at home.